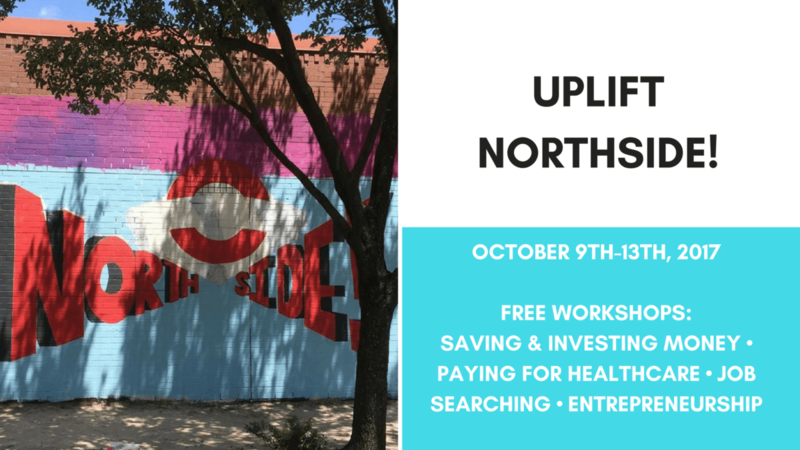 Press Releases | The Greater Northside Workforce Coalition to Host Week Long Event "Uplift Northside"
Uplift Northside is a week long series of free, financial security workshops for the residents of the Near Northside and Northline neighborhoods in Houston, Texas. Beginning October 9th and ending October 13th, the Greater Northside Workforce Coalition, convened by Young Invincibles and in partnership with Avenue CDC, will put on a series of free, educational workshops on entrepreneurship, financial literacy, and job searching. The Coalition’s vision is that Uplift Northside will act as a “resource tour,” re-introducing residents to longstanding institutions that help young adults complete their educations, gain the training needed to enter in-demand industries, and improve their financial literacy. The Coalition’s goal is to increase the income and wealth of Greater Northside residents and strengthen the existing programs and partnerships in the neighborhoods. YI South and the Greater Northside Workforce Coalition invite community members of all ages to attend a workshop during Uplift Northside Week! Navigating our healthcare system can at times be complicated. Learn how to effectively use our healthcare system and ways to pay for your care. Refreshments provided! Location: Clark Park Community Center; 1 p.m.-2:30 p.m.
Free and open to individuals and families interested in learning how to improve their financial stability. Staff is available to assist entrepreneurs in our community with education, capital, and mentoring to realize their small business dreams! No appointment necessary! This will allow Entrepreneurs to showcase their products and services. A huge variety of talent ranging from arts and crafts, to jewelry, food and more!! Don’t miss this event!! For a complete list of workforce development resources check out our Coalition’s Brief of Services!